This hotel is 100 pct non-smoking. Be welcomed with a warm chocolate chip cookie upon arrival at the DoubleTree by Hilton Hotel Campbell - Pruneyard Plaza. 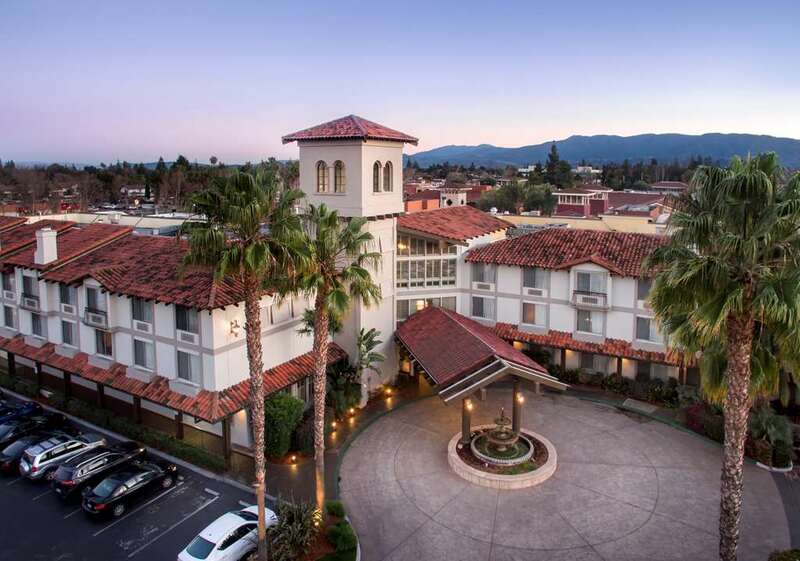 Located in the extensive Pruneyard Shopping Plaza in Campbell CA our hotel offers easy access to a wealth of shops specialty food stores international restaurants and leisure options including a cinema. Downtown San Jose the Santa Cruz Mountains the Santa Cruz Beach Boardwalk and Santana Row are all easily reached from our relaxed Campbell hotel. All of our stylish guest rooms and suites feature a variety of amenities to make you feel at home including a mini-refrigerator an iPod dock a 42-inch TV an ergonomic work desk and complimentary WiFi. We also offer impressive suites featuring additional space and amenities including a separate lounge and a fireplace or whirlpool tub. Host a successful event at this hotel in Campbell with five flexible meeting spaces including an attractive Garden Terrace - perfect for weddings or celebrations. Stay productive in the 24-hour business center offering a range of useful services and amenities. Start your day with a delicious breakfast as you read the morning paper. Energize with a workout as you overlook the Pruneyard Plaza Shopping Center in the 24-hour fitness center or swim in the heated outdoor pool with whirlpool spa. After a busy day stroll along the scenic jogging trail nearby or relax by the welcoming fire pit in the Mediterranean-inspired outdoor patio area.